The summer of 1977 holds a very special place in my memories. I was 13 years old and delivered the Santa Barbara News Press after school, life was good. My best friend Mike was convinced that we could make movies together. We were saving up our paper route money to buy a Super 8 movie camera so we could film our epic adventure. We did not realize the wonder we were about to experience. What the both of us witnessed that summer still has a hold on me to this day. If you ask my children, they will tell you it was the year their daddy saw "Star Wars." "Star Wars" has been a part of my life in subtle and not so subtle ways. On that summer day, Mike and I walked into the theater not sure of what to expect, and we left with our heads full of a new worlds of wonder and excitement. We wanted to be Luke Skywalker or Han Solo, of course, because they were the heroes. On the other hand, Darth Vader was a symbol of the evil tyranny that our parents represented. 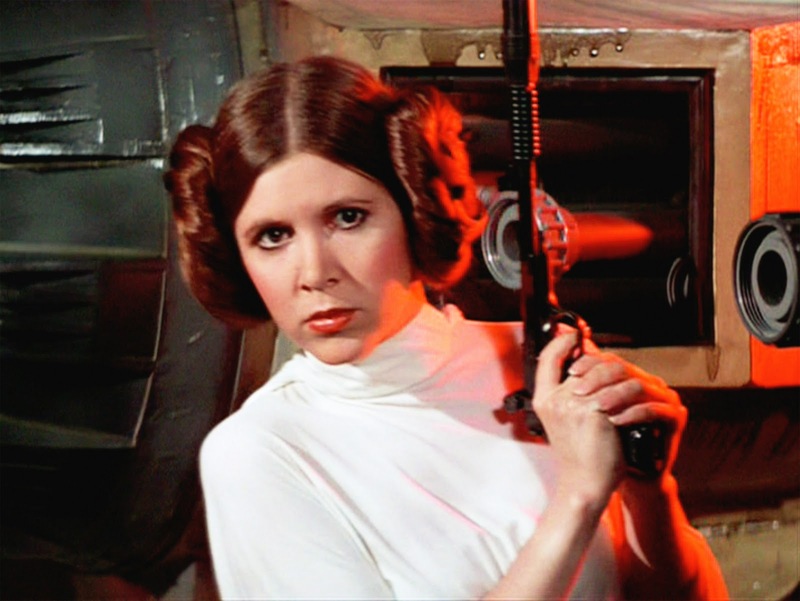 All summer long my friends and I talked about "Star Wars;" about Luke, about Han Solo and of course about Princess Leia. When you are a thirteen year old boy Carrie Fisher looked pretty darn good! During that summer we saw "Star Wars" at least ten times at the theater. Now, I suppose you are thinking that this was just a phase I was going through and by fall when school started I was cured. 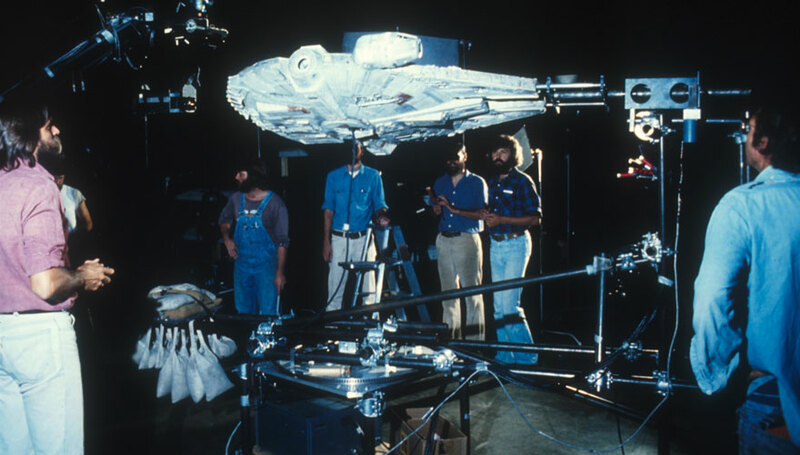 Actually Mike and I just redoubled our efforts to learn everything about how George Lucas made "Star Wars;" from the lighting, sound, visual effects, and directing. The next school year we both signed up in Drama class so we could learn how to act in our film production. By the way, I haven’t mentioned “the movie” since the beginning of this essay so I am thinking that you may have thought that I had forgotten about it; not so. In fact the whole purpose behind learning film production was so we could produce a film that was better than Star Wars. We tried very hard to learn everything about making movies that our little minds could hold. However, little did we know that the end was near! Want To Finally Master Your Camera? As the summer of ‘78 quickly approached Mike and I had scripts prepared and we started to cast our movie. We even built up enough courage to ask a couple of girls at school to take the female lead characters in our movie. Our thoughts of a perfect summer were of the beach, the babes and making our movie. Life couldn’t get much better. Unfortunately, my dad announced that he had accepted a job at a community college in the not so booming town of Ridgecrest CA. Looking back to that day so many years ago, I can still remember the sinking feeling in my stomach as I had to tell Mike that I was going to be moving. All of our hopes and dreams of making a movie were washed away. The following weeks my brother and I kept our minds busy packing for our trip to the dry and dusty Mojave Desert. Upon arriving in the desert, my dad went through some extra effort to borrow from the college a ¾” video tape machine, and a bootlegged copy of "Star Wars" for my own private use. However, when whoever made the copy, they didn't use the anamorphic lens and the characters were squished a bit. That didn't matter, I watched the tape over and over. I was too old for the toys, but not too old to build the models. I wore the tape out that summer and I learned every line of every character in the film. The new decade came pretty quickly and I read every different Science Fiction book I could get my hands on. My love for "Star Wars" was renewed in 1980 when "The Empire Strikes Back" was released and its creator, George Lucas had revealed some important clues about Darth Vader; and the mystery deepened. I spent many hours writing and talking with my friends speculating what Darth Vader meant when he says “I am your father!” Was he a clone? Is it true? Who was Luke’s mom? Is Han dead? I thought Luke and Leia was an item, how was I to know that they were brother and sister? And life goes on. I graduated from high school in the summer of 1981 and promptly moved myself back to the coast. By May of 1983 I was nineteen years old , ready, willing and able to stand in line at the theater for eight hours prior to the midnight opening of “Star Wars – Return of the Jedi” My friends and I were older but not wiser. As the years pass, I worked, I had fun, and I got married. My wife and I moved to Arizona in the fall of 1994 a year after my daughter was born. Times change, people change, kids grow up and I get older everyday. However, the impression that the film made upon me those many years ago has remained. When my daughter was four going on five, Lucas re-released Star Wars once more. Now the title of the film is "Star Wars: Episode Four - A New Hope." I took my five year old daughter Debbie to witness one of the greatest events of my life. Watching the movie on the big screen as an adult was a totally different experience for me. I am not sure I actually watched the whole movie that day but I know spent more time watching my daughter’s reaction to the images. I think I cried in the theater that day watching the same awestruck look in my daughter’s eyes and wondered if I had that same look in my eyes twenty years ago. My son was born later that year in 1997, and two years later my wife and I decided to go our separate ways. That same year "Star Wars – The Phantom Menace" was released. I promised myself that I was not going to learn every line each character said. I was wrong, my kids watched the DVD day in and day out. I would fall asleep on the couch with the movie playing. I was having nightmares of Darth Mall coming after me. "Attack of the Clones" was released in 2002, and to my excitement my kids were old enough to watch this new episode at the theater. Once again my eyes would wander over to their little faces just to see the twinkle in their eyes. Debbie, my daughter started wanting to be "Star Wars" characters for Halloween. As that year's Halloween approached, I would wait till my children were asleep and I would go out and work on my costume. I worked many nights in the garage in complete secrecy. Who did I dress up as? I made a complete Darth Vader costume; Light Saber and all. When the time came for me to take the kids on their Trick or Treat quest, I came home from work and donned my costume in the garage. I made an entrance into the house and watched the eyes of my seven year old son pop right out of his head. Tony backed himself into a corner and I could tell that he was a little frightened and very confused. 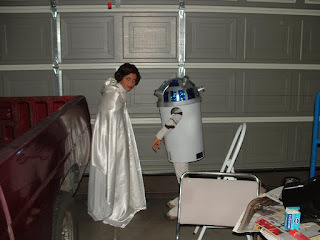 I reached out to him with my gloved fist and said to him “Anthony, I am your father!” My daughter dressed up as Princess Leia and for my son Tony, I built a custom made R2- D2 costume out of a plastic trash can, many plumbing parts and lots of paint. So as Halloween 2004 was approaching I made my mind up to do something I have never done before as an adult. I decided to go in costume to take my kids Trick or Treating. My new bride handed out candy dressed as Master Yoda. I watched in total admiration as Tony pretends to either Obi-Wan, Anakin or just as I wanted to be Luke Skywalker. For many years I have held the original excitement and wonder of these movies in my heart. As I see my children enjoying so much of the "Star Wars" universe that has kept me young these many years, I pray that they will be able to share that same experience with their children and look into their eyes and regain the childhood that this world forces them to leave behind so soon. 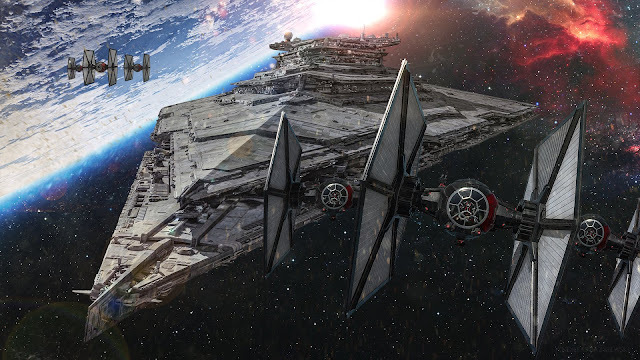 "Star Wars Episode VII: The Force Awakens" soon. People ask me, did you buy your tickets yet? Tickets went on sale after the showing of a preview of the film during the Superbowl. No, I did not buy tickets. Am I going to go see the film? Of course I am. Silly question. Am I excited, of course I am, but now after thirty some years later, I know that I will watch the film in the theater several times. I will buy the Blu-ray, watch it many times and I will discuss the film and do many comparisons to the original. Because, that is what I do. Will I be dissapointed if J.J. Abrams fails to reinvigorate the franchise? I highly doubt it.